Valley Cares Inc. is a community-based 501(c)(3) non profit organization committed to providing affordable housing and supportive services to the elderly residents of the West River Valley and surrounding towns. 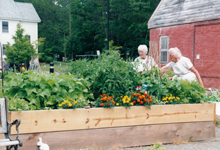 Valley Cares acts as the developer and property manager for West River Valley Senior Housing in Townshend, Vermont. West River Valley Senior Housing was recently named the Nation's Best New Senior Housing Project by the National Affordable Housing Tax Credit Coalition.